ADA requirements | Accessibility & play resources | KaBOOM! In 1990, the United States passed historic legislation requiring that public spaces be made more accessible to people with disabilities. In 2000, the U.S. Access Board published its official guidelines pertaining to play areas. Like all Americans with Disabilities Act guidelines, these should be considered minimum—not maximum—standards to follow. By incorporating universal design principles you will exceed ADA and create a play environment that really allows EVERYONE to play! You must provide access to at least one of each of the types of ground-level equipment at your play area. You must provide access by ramp or transfer system to at least half of the elevated structures at your play area. The number of accessible ground-level components required depends on the number of elevated structures provided. Surfacing on the way to, under, and around play structures must acceptably cushion falls. The surfaces must accommodate people using wheelchairs. For exact guidelines and specifics, ask your playground manufacturer and read the ADA standards. A play component is defined as an element intended to generate specific opportunities for play, socialization, or learning. Play components may be manufactured or natural, and may be stand alone or part of a composite play structure. A ground level play component is a play component that is approached and exited at the ground level. Examples include swings, spring rockers, sand boxes, and panels with educational toys. An elevated play component is a play component that is approached above or below grade and that is part of a composite play structure consisting of two or more play components attached or functionally linked to create and [sic] integrated unit providing more than one play activity. Examples include climbers, overhead play equipment, double slides, or tubes approached from a platform or deck. 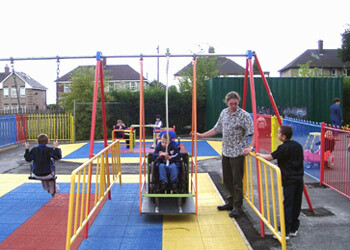 These play components may be made accessible through ramps or/and through transfer systems. An accessible route is defined as a continuous unobstructed path connecting all accessible elements and spaces of a building or facility.